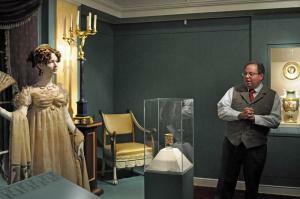 5:30-6:45 pm Mansion, including the new Russian Sacred Arts Gallery, is open for touring. Dr. Scott Ruby is the Associate Curator of Russian and Eastern European Art. He has worked at the Westminster Abbey Museum in London, as well as the Jewish Museum, the American Craft Museum, and the Cooper-Hewitt Museum in New York City prior to joining Hillwood in 2006. His recent publications include “A Toast to Vodka and Russia,” in The Art of Drinking and Masterpieces of Early Christian Art and Icons and “The Power of Porcelain: the Gardner Order Services for the Empress of Russia,” in Ars Ceramica. He holds a Ph.D. from the Courtauld Institute of Art in London, and he will participate in the prestigious 2014 Royal Studies program in the UK. In 2012, he curated the exhibition The Style that Ruled the Empires: Russia, Napoleon and 1812, and in 2014 he curated Passion of the Empress: Catherine the Great’s Art Patronage. Along with Dr. Wilfried Zeisler, Hillwood’s curator of 19th century art, he is working on an exhibition entitled Splendor and Surprise: Elegant Containers, Antique to Modern, which will open in February 2015. $20, $7 Student, Free for Members and active Hillwood volunteers.